Household | OH! Honestly, Mariah! Hi folks, simply unbelievable light is emitted by these teeny tiny Micro LEDs String Lights! Take a look at these fantastically bright little lights that I received for this review. The 20 LEDs String lights are on a small plastic coated wire that is 7 foot long and spaced 4 inches apart. The color of my lights are green and it takes 3 AA batteries. There is not much that I can say about these lights other then WOW! I see that these light would be perfect for crafting, the Micro LEDs String Lights are so tiny and thin that they are easily manipulated to a design you want. This Picture was taken at dusk. For the crafting idea I had for these lights, since the lights are green, I decided to tape it up with simple scotch tape in the shape of a shamrock on my back door window. I first took an old CD/DVD envelope (in this case plastic) and folded it over loosely around the battery pack and then used Packing Tape to Attach it to the Screen Door Frame. The battery pack is light enough that those paper like CD/DVD Envelopes should work too. I then just strung up the lights in a Shamrock like shape taping it up here and there with clear scotch tape. When I do this for St. Pat’s Day I will use some Poster Paint and paint the shamrock green and tape the lights up around it, so that the design is more obvious (poster paint washes off from windows/glass easily). Sorry blurry, for nights now we’ve had thunderstorms so finally tonight I stood in the garage to get this night shot of the shamrock. I am very impressed with these little lights and I am sure I will come up with more design ideas for them as time goes on. Thank you so much to RTGS Products for entrusting me with this review… these lights are so handy, just the thing I needed (a chance to do something Crafty again). I’ve been putting on the Overalls and acting like a Construction Worker here. It’s been a long long busy 10 days here. We had a lot of hail damage here in May. Our insurance has decided to cover only the roof, paint, caulk and very little else…. oh and the cover to our fire pit. The rest of that garage (garage with 2 additions, a “man cave” on one side and a storage area on the other) and the damage from warping boards to some of the interior water damage (what they call “flood damage”) is our responsibility. However the damage to the siding was extensive, as was the black mold growing on the inside drywall and we are working hard tearing out damaged siding, one whole side had to be demoed and put not only siding up but they failed to have a vapor barrier inside! So, being that that side of our garage and attachment rooms to it, is right up against the fence, and it was the most highly damaged area of the building we had to tear down the chain link and crawl through to the other side of the fence to work on that side of the building. We have finally finished that major part of the project. Above are some samples of the Neighbors side of our garage and the hail damage from days worth of rain and hail. Now we are repairing the odd siding boards here and there, with Hardie Boards, and of course we are calking, painting. And once the roofers get their work done, we will be taking care of the black mold, the holes from leaks in the ceilings and the inside of the windows where the water also came through. hail damage to fire-pit cover, this IS covered by our insurance. Sample of the leak damage to the inside of windows. I have learned about our materials that we’ve used and I love Hardie Boards (they are fiber cement boards), though it was a pain to lift, they are not light. And what a pain to haul in a van, without a pickup truck and our one volunteer never returned a phone call to say he was ready to help with his pickup and never returned hubby’s phone calls. So hauling the Hardie Boards and one piece of drywall went on top of our van, so glad that there was a tall man at Loews to help hubby reach… I could barely climb to help put the strapping up to strap those puppies down, much less reach with heavy board to put them on top of a van. Sample of one of the leaks in the ceiling. We are calking all around the garage with Dap’s “Alex Plus” (acrylic plus silicone), we bought the 12 pack Contractors Case. The people that previously worked on siding didn’t caulk much at all, so we are caulking like made all the way around the building. I have to say I have become the queen of caulking, I put up a wicked nice bead now. lol Though my hands get tired easy as they are pretty weak and painful from my neck problems. I love the caulk as it is paintable and it covers small holes from the hail damage well. The paint we are using is WONDERFUL, we are using Valspar Ultra Paint and Primer in the color “White Pepper,” the color is so much better then the light buttercup yellow (what I am calling the color) that they used on the house trim and garage. This stuff is working wonderfully, covering up the Hardie Board, the caulking and even the old paint used on the garage. The Valspar Ultra is heavenly to use as it covers wonderfully with just one coat, hubby has been playing with a paint sprayer with the Valspar Ultra and some product to thin the paint, a product from Flood called “Floetrol.” The only problem with the paint sprayer is that I think we haven’t gotten the viscosity right with our first mix with the paint as it went on way too loose and dripped all over our cement as I tried to use the brush to spread the paint out more and it dripped all over. Finally I figured out how to use the paint brush to sort of scoop up the paint some as I worked the sprayed on paint. About 1/3 the way done on one side of the garage, all caulked, primed the gutter and starting to paint the new color. Speaking of brushes, we did go the cheap route as we needed some new brushes and we went with Project Select, 3 piece Painter’s-Pak, cheap is as cheap does. The large brush in the pack that I chose to use had the head fall off, I knew it felt loose as soon as I got it out of the package, come to find out the little nails that were in it weren’t fully inserted from the ferrule into the wood handle. I dropped that brush into the dirt, I am glad I didn’t have to fish it out of the gallon of paint! I washed the brush head off and hubby went in and put in some little screws to hold the brush head onto the handle. Now the brush works better, although the cheap brush loses bristles now and then, I am glad that I know not to get the paint in the ferrule area while painting or it would be worse. Well folks, I took a break while writing this for a few days, as I needed to help cut some Hardie Board, do some more calking and painting, while the weather held out. Oh and we just couldn’t take the heat in the house any longer, and installed an old Air Conditioner. The Air Conditioner was donated to us by my parents, and I believe we had it in the 60’s in our homes, so it’s not energy efficient, nor is it strong enough to do much (even in this small house). But cooling off the house to 92 degrees, when the thermometer is reading 102 outside is a help! Of course we put in the AC just yesterday and I put up plastic, then we had a bad thunderstorm and water started coming in through the plastic last night, so I was running around gathering up most all the towels we had to sop up the rain water that was coming in. lol Today we cut up an old board to cover the area around the window and I am crossing my fingers that I don’t have another night like last night again… Wish me luck! Okay off I go closing this up, nothing like writing a post over several days (3 to be exact), this old gal is tired, in pain and worn out, but loving the look of the work we’ve done so far. 🙂 I can’t wait until it’s all finished and I am crossing my fingers that we can manage to get a newer AC in the house soon, one that will really do a lot of cooling and be more energy efficient, I am so tired of feeling like I am melting all the time. lol And of course I am anxious for out projects to be completed so that I can recover, relax and concentrate on the blog more again. “Man Cave” side of the garage has carpet damage and black mold (just a sample of the black mold there). In the mean time, I felt that I needed to share with everyone what I am going through right now in my life at home. Life happens, and between these home emergencies, chronic pain and disability issues, things (like the blog) get set aside. Just a sample of all the black mold on the storage room side of the garage. It’s all long the wall that faces the outside. Problem, the people that worked on the siding last didn’t bother with a vapor barrier… we are adding that while we work. A job well done saves these sort of problems. I thank you all for understanding my doing some rush posts here and my otherwise absence, I hope that we can get back to normal here in the next 2 weeks. Most of the repairs to the siding have been done now and almost half the painting is done. 🙂 The huge project will be at the back of the garage is on a hill… it’s going to be a real pain to caulk and paint! Then, of course we will be working on some Kilz, new Dry Wall, Dry Wall Patching and floating (what hubby calls what we will be doing around those windows that had the water coming through) all around the interior of the garage. Disclaimer: I, Mariah Lockwood, have not been compensated for the products mentioned in this News From Home, all items mentioned have been purchased with my own money and I just thought they were worth mentioning in this News From Home Update. As usual this is just my option and my experiences, yours may differ from mine. Hi folks, I am going to review this Company and their service on my blog. We are doing this ourselves and this is not a sponsored post. We just had a nice young man who represents Solar City come to our door. It was a really pleasant visit with him as we asked a lot of questions and yes, we asked the hard questions too. So far so good, we signed up and have an appointment for June 2nd where they will come out and survey our roof top and see if they think it’s worth installing the solar panels and (of course) free solar panels onto our home. We love the idea of helping the Environment and saving ourselves some money on our Electric Bill. The “catch” not really a catch when you look at it, they pay for the installation and panels, we get a reduced price on our Electric Bills. Why did we choose to go with them? We couldn’t afford our own Solar Panels, yet they install them, maintain them and cover all those prices. They will however make the money from the Electric Company for the extra supply of Electricity the Solar Panels produce, and yet we will see a savings as well. So far this looks pretty cool to me, even if it’s only a few dollars a month, even a little bit of savings will help us out! Besides, we’ve heard that having Solar Panels on the house will bring up the value of our home too! I will further my review as time goes on here, the next step is the Survey of our Rooftop on June 2nd and we will go from there. For right now, they did have to check out our Credit Score for acceptance and we were accepted, we have 30 days to back out, if we so choose. We were a little nervous about supplying the Social Security Number to them and signing a electronic contract, but we asked a lot of questions and I looked up reviews on the company online and thought it was worth the risk, besides we have Life Lock and that will help us monitor the usage of our information. Now if we didn’t have lifelock on our SS numbers we could have just had them look us up for a credit score by name and address… but we have our safety in place to be aware of anything going on that is off. What do you think of the Company friends? Would you go for this too, if so why and if not why not? Please let me know. Join Me For Coffee? Well how about you win a coffee maker and coffee & say Hi to me online? 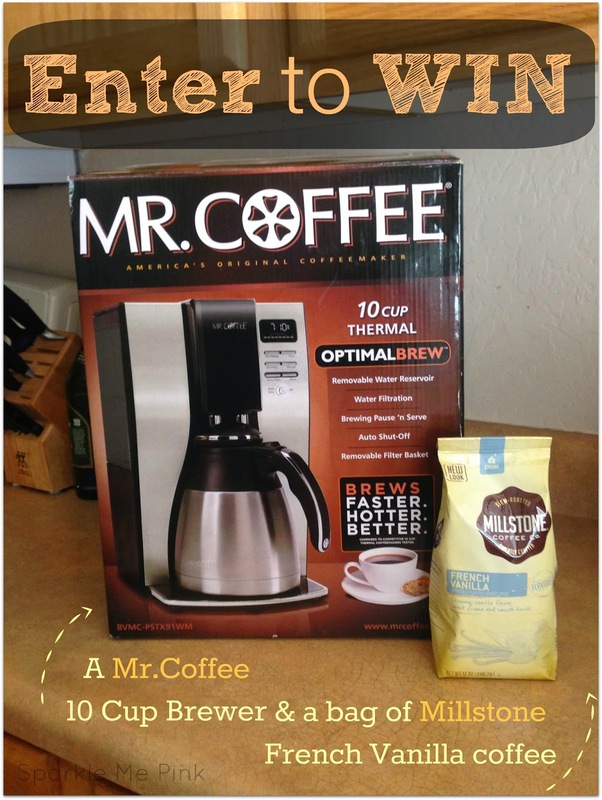 I know that I love great Coffee and this is one terrific little giveaway my friends! If you already have a coffee maker, this would be a great gift for Newlyweds or for that Student going off to College. Or just keep this as either a spare or place it in your office. Sparkle Me Pink is responsible for the purchasing and shipping of this prize. If you have any questions please reference my disclosure policy page or email me. (sparklemepink88@gmail.com) This giveaway is not sponsored by, endorsed by, associated with, or affiliated with Facebook, Twitter, YouTube or Pinterest in any way.